Application: Cement industries, Rubber & tires industries, Fertilizer industries, Plastic industries. 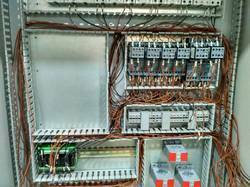 Multi Way Automation has done number of Turnkey Projects in Industrial Automation using PLC / AC DRIVES / SCADA & DCS CONTROL SYSTEMS. This is a one of its casting machine that can take care of all your casting requirements. Automatic Casting and Demolding of WC, Wash basins, Shower Trays, Tanks, Lids etc. it has two parts casting molds with Vertical closing. Safe and Reliable Ball Screw Lifting System. A Programmable Logic Controller, or PLC, is more or less a small computer with a built-in operating system (OS).This OS is highly specialized to handle incoming events in real time, i.e. at the time of their occurrence. Enlisted amid one of the distinguished business names, we have been presenting a wide assortment of PLC Based Automation Systems.